← Caption Contest 54: Feel the Fury! 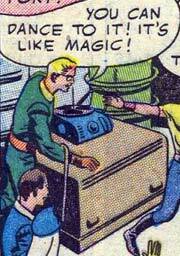 Random Panel: "Or a record player! The future is AMAZING!" 6 Responses to Random Panel: "Or a record player! The future is AMAZING!" Are you sure that’s about the device? And not, say actual dance-capable music? They find a disc with grooves in it on some alien plant-run planet, and he puts it in a record player, and music comes out. Sorry, but I can’t dance to magic. Heh. Magic just ain’t what it used to be. The compatibility issues involved boggles the mind. Spindle size, direction, and speed all need to match. It would be like putting a floppy disk on and expecting it work. Crazy. It’s their first introduction to Rock and Roll after years of Prep School polka classes.